On February 2, 2011, this was the front page of the official website of the man the United States Justice Department recently reported was the admitted ringleader of the largest college admissions scam in United States history. Thanks to wiretaps and a mountain of documentary evidence, Singer has now admitted to masterminding a vast criminal conspiracy that the U.S. Justice Department reported on March 12, 2019, was designed to provide academically unqualified students admission to American universities which most prominently included the University of Southern California (USC). At the heart of the sprawling, 200-page Federal indictment detailing Singer’s vast criminal conspiracy to defraud the United States government was how over $1 million in bribes from Singer to a high-ranking USC athletic department official – much of which was deposited in a USC athletic department bank account for official school use – allowed Singer’s academically unqualified clients to gain admittance to USC by falsely claiming they played sports which included football, water polo and soccer. While one high-ranking USC athletic administrator is now likely to serve time in Federal prison, along with 49 other individuals charged in the Federal indictment, those crimes only date back to 2015. Phone call transcriptions contained in the March 12 indictment recorded the California-based Singer, who is continuing to cooperate with Federal law enforcement officials, reporting to his co-conspirators that his university admission scheme involved over 800 students spanning 24 years. In 2008 Singer launched an elaborate website designed to lure individuals into patronizing the same services that fueled the undue admittance of academically unqualified students into USC. Above is a video greeting that appeared on Singer’s site in 2011. We are proud to announce the following new strategic alliances and partners. Win Forever is a proven system of success for those who compete to maximize their potential in sports, philanthropy, business, and life. 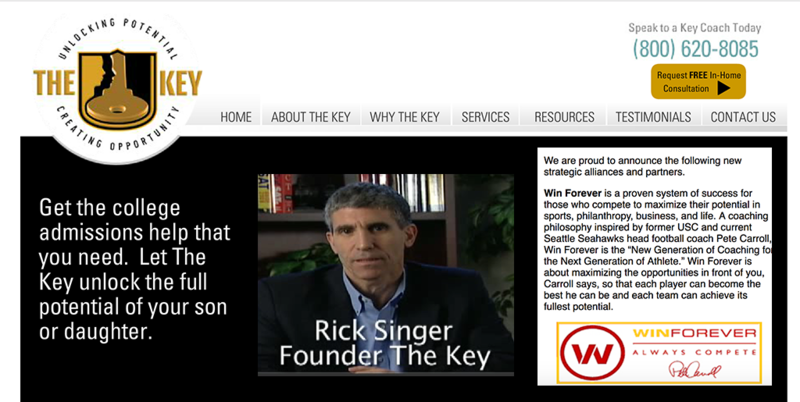 A coaching philosophy inspired by former USC and current Seattle Seahawks head football coach Pete Carroll, Win Forever is the “New Generation of Coaching for the Next Generation of Athlete.” Win Forever is about maximizing the opportunities in front of you, Carroll says, so that each player can become the best he can be and each team can achieve its fullest potential. At that time, Win Forever was an enterprise owned and operated by Pete Carroll, who was the head football coach at USC from 2001 to 2009.